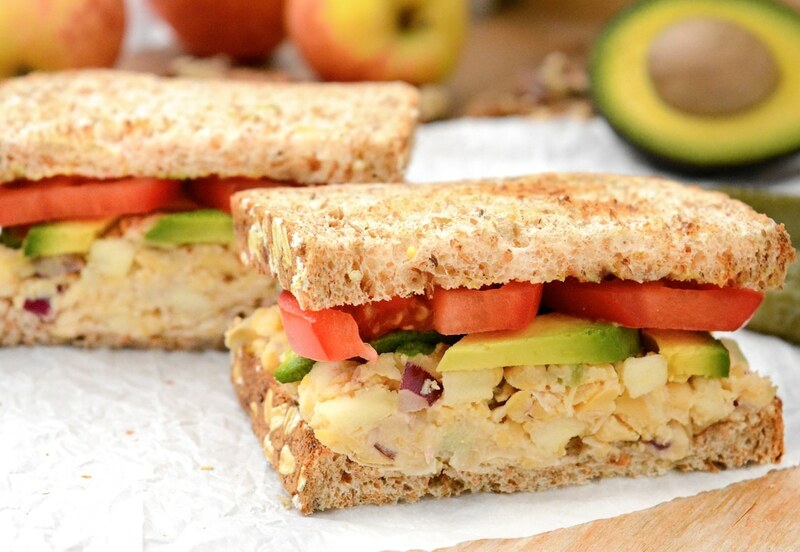 A vegan Apple-Walnut Chickpea Salad Sandwich that tastes like no other! It’s made with an oil-free tahini dressing, gluten-free and ready in under 15 minutes. Prep the salad ahead of time for a quick, grab-and-go, healthy lunch. 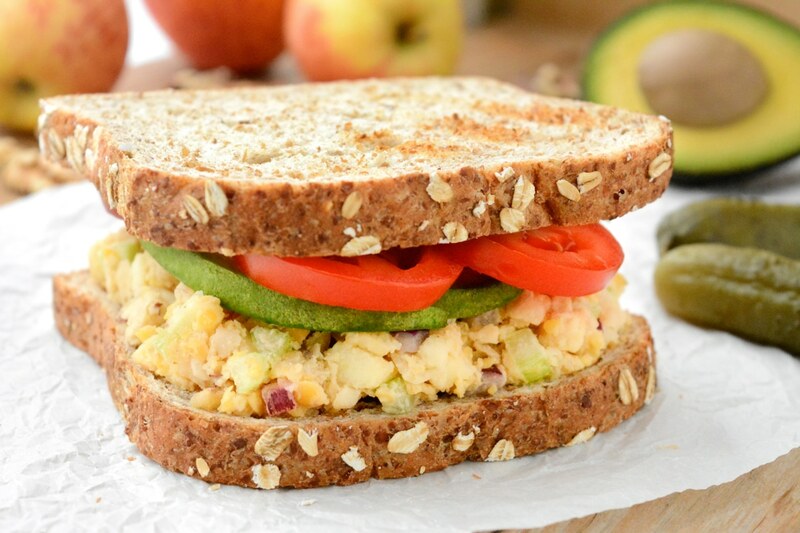 Bring in the Apple-Walnut Chickpea Salad Sandwich! 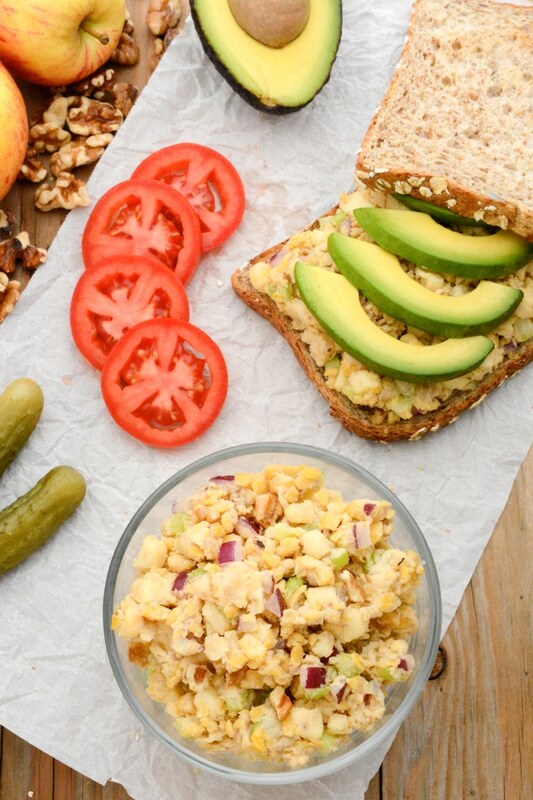 What sets this Chickpea Salad Sandwich apart from the rest? Sweetness and moisture from the apple. A touch of tang from the lemon tahini dressing. Paired with crackers for an amazing snack. straight out of the bowl, because it’s delicious on its own! And it can be made nut free by leaving out the walnuts. 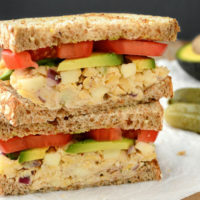 Although, that would alter the name to apple chickpea salad sandwich, it still sounds irresistible! Can I use dried chickpeas? I prefer dried chickpeas for this summer salad. They tend to give it a fresher taste. But if you’re in a pinch, canned can be just as good. 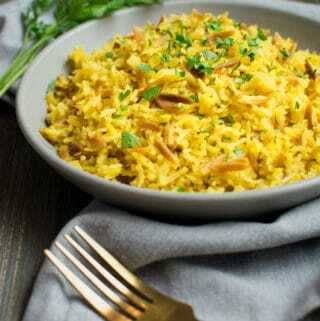 To use dried chickpeas––cook about 1/2 cup of beans. making extra means more delicious chickpea recipes can be made. Toss those extra chickpeas in your food processor with tahini, lemon juice and seasonings to make the the best hummus. Slather some of that creamy hummus on a few pieces of toast to make hummus avocado toast and you’ve got yourself another oven-less lunch. If you loved this vegan pizza recipe, please leave a 5 star rating in the recipe card and share your thoughts in the comments below. Also, if you snap a photo be sure to share it with us! We love to see your creations! You can find us on Pinterest, Facebook, and Instagram. In a large bowl mash the chickpeas. I try not to leave any whole chickpeas, but halves are perfectly fine. Mix in the chopped onion, celery, walnuts and diced apple. Pour in the dressing using a spatula to scrape the bowl. Then fold it into the chickpea mix. Chill in the fridge for 30 min. Or if your impatient, like me, skip the chilling and eat it right away. 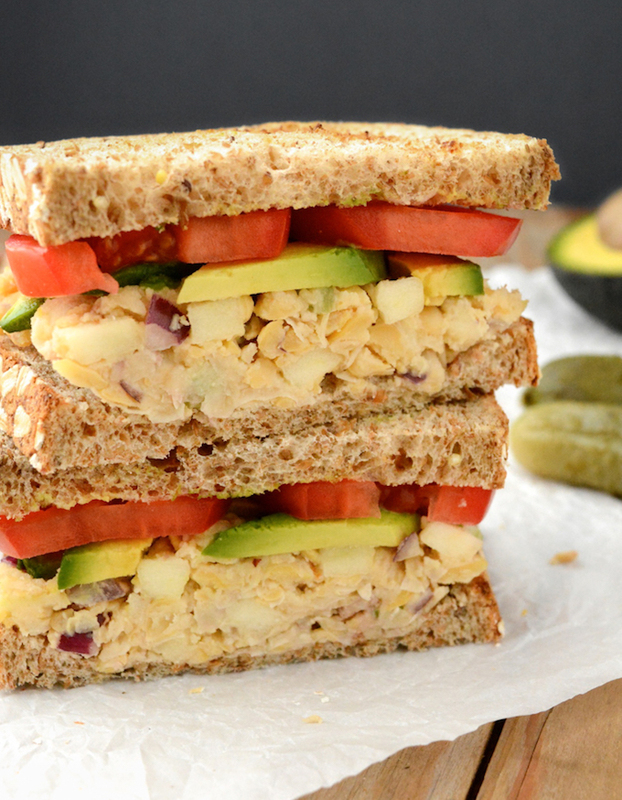 Add the chickpea salad to your favorite toasted bread and top with avocado, tomato, salt and pepper. 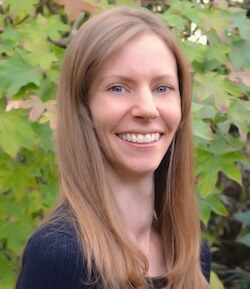 Would it be okay to use milk instead of a non-dairy product? Thanks for the recipie-- looks great!! 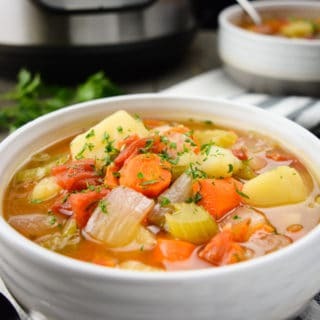 Oh my gosh, I love love love this recipe! So delicious! I just made this for lunch today and it was amazing! 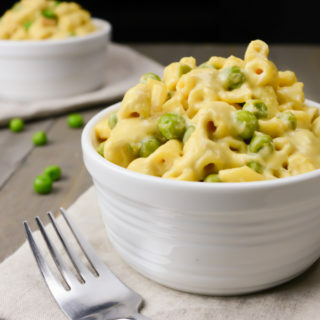 I'm trying to go full plant based diet and this recipe proves plant based doesn't have to be boring. Thank you so much. This is a keeper! That's great you're on your way to being fully plant-based, Susan! I'm so glad you enjoyed the chickpea salad!! It's super easy to prep which makes it a summer favorite of mine! What a great 'faux chicken' salad, thank you! 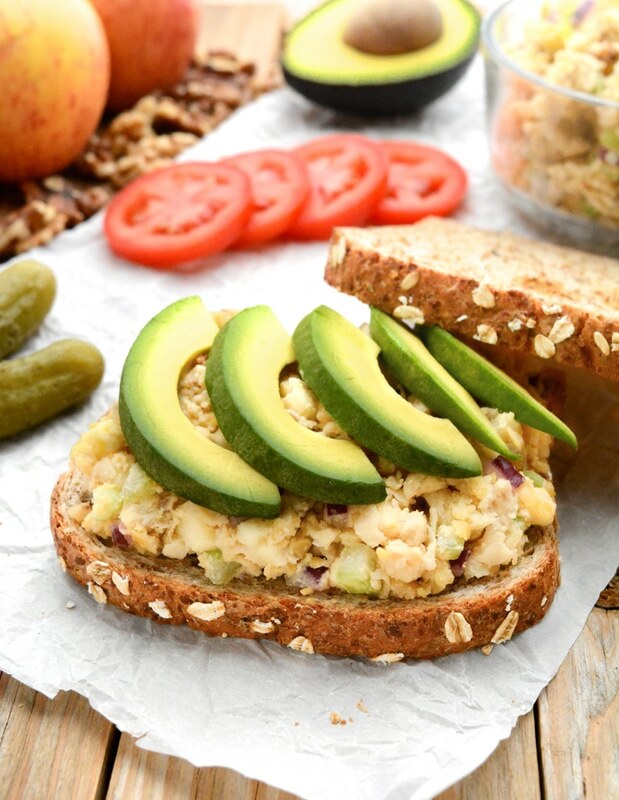 I made it for my husband and I to take on a day hike, it was perfect and quite a well rounded sandwich with the walnuts and apples. My husband doesn't even like celery, but it definitely added the extra crunch and in the end we ended up fighting who got the last of it lol! I love the fact that the dressing in your recipe didn't include any egg-free mayo yet it still tasted similar enough to the chicken salad my mom made me when I was growing up. So glad I found it, it's a new favorite and a great alternative to eggless salad sandwiches. 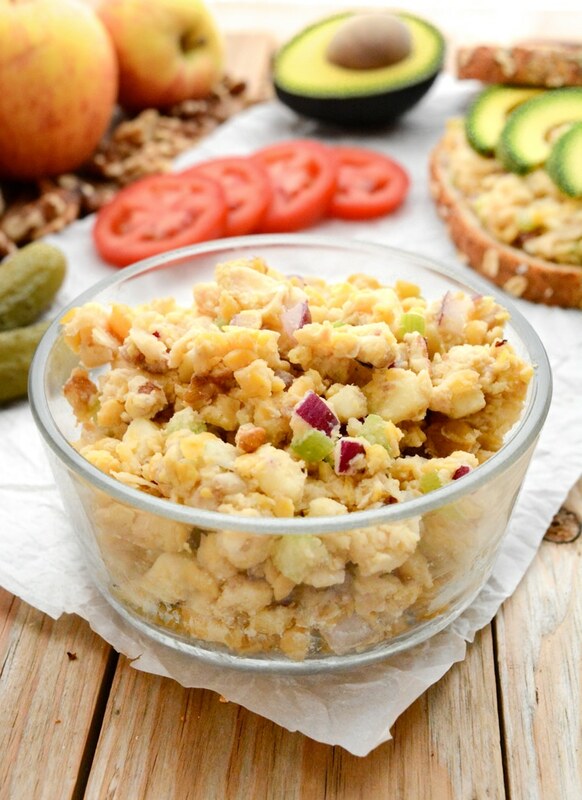 Just curious as to what the calorie, protein, carbs, fats and fiber per serving for the chickpea salad? What bread are you using? It's a multigrain bread from Silver Hills Bakery.